In the first half of the book, Devdutt establish the context of Queerness from the global mythological sphere bringing stories from Vikings, Egyptian Gods, Bibliographic readings and Chinese legends. In the second part, he brings stories that challenges our preset perception on sexuality. Every incident the book shares as indicative of the presence of a middle gender or a non-heterosexual conduct comes from various ancient sources such as Ramayana, Mahabharata, Puranas, present folklores, texts of South Indian authors & sages, Sangam Literature, Jain Texts, Buddhist Texts etc. The sheer amount of research done by the author makes the book a masterpiece. Devdutt Patnaik is a Doctor. He worked in the Pharma Industry for 15 years. After that he became an author. With more than 50 books and 500 articles under his belt, Mr. Pattanaik writes about Mythology in the light of today’s times. All his books are illustrated by him too. I am a big fan of the ace mythologist. He effortlessly manages to throw a new light on stories that have been told and retold time and again. 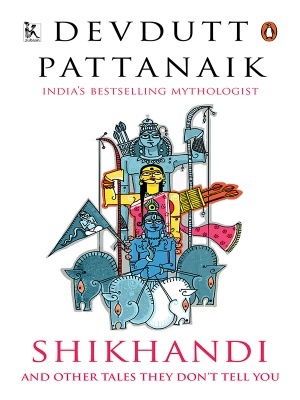 Shikhandi: And Other Tales They Don’t Tell You is another addition to that list. “Time for empathy, and expansion of the mind. Appreciate the stories of sensuous men and women, celibate men and women. More importantly, appreciate the different context in which celibacy was celebrated and the different context in which the dance of the enchantress was celebrated. Even more importantly, appreciate the vast volume and diversity of India, where things have never been static, where things are never static, where the past and the present coexist simultaneously, the liberal coexists with the conservative, the wise next to the most unfair.” says Devdutt.